When I start working with a client, we spend a long time exploring the organisational issue they want to work on. I need to understand enough about the situation to be able to support my client, and when I work with physicists, chemists, engineers, etc. on technical issues, this is a challenge. And it doesn’t make much difference whether I have to do this in my mother tongue, or in my second language. I remind my client that I am a mere mortal, not endowed with maths/ engineering/ etc. super-powers, and they need to explain it to me as if I were a child of 4. If this doesn’t work, I encourage them to talk exhaustively about the situation while I take notes, until I can start to make sense of what they’re saying. The magic phrase is, “Interesting. Please tell me more.” I stop them when they use acronyms, and ask them to explain them to me. After a while, when I’ve heard the same incomprehensible term used a few times, I can say “Could you tell me a bit more about [incomprehensible term]?” Eventually I learn enough basic vocabulary from their world to be able to discuss their problem with them. These are some sense-making strategies that we can use to prevent communication from breaking down, especially when a) we can’t understand a word the other person is saying and b) the stakes are high, i.e. not understanding what the other person is talking about could cost us a lot. This is my second post about Pragmatics, (read the first here), the study of the rules of communication, of how we systematically break those rules, and what we can do to make sense of what people say to us. In Paul Grice’s 4 Rules of Conversation, rule 4 states that the speaker should use words they know the listener will understand, a rule my clients break all the time. Grice’s other rules of conversation involve telling the truth, talking for an appropriate amount of time, taking turns, maintaining a logical flow and avoiding ambiguity. We all break all the rules of communication, frequently, sometimes unintentionally, sometimes for fun, sometimes as an act of aggression and sometimes for purely cultural reasons. An Italian client of mine was telling me about her Canadian au-pair, who she recently overheard saying to an Australian au-pair she met in the park, “Finally, someone I can speak grown-up English with!” She was talking about having to speak simplified English not only to the children she looks after, but to all the adults around her as well. Speaking like this requires an effort, an effort we make most of the time with children, and should make when we talk to non-experts about our areas of expertise, and when speaking with people in a language which isn’t their mother tongue. But since it requires an effort, we often don’t. If we are confident communicators in our mother tongue, we often feel this is because we command an impressive vocabulary, can use elegant and witty turns of phrase and can vary the way we can express our ideas. In our second language we lose the ability to perform linguistic gymnastics, but following Grice’s 4 rules of conversation involves doing more with less. Plain, no-frills language is very effective. We need to remember this when we try to function in our second language and are struggling to articulate what we want to say, and to understand what is being said to us, as well as struggling with all the opportunities for misunderstanding, embarrassment, and communication breakdown provided when we interact with another national culture. Knowing a language fluently is not enough to communicate effectively with people from other countries. The rules for being polite in different cultures vary enormously from one country to another, even just within Europe. 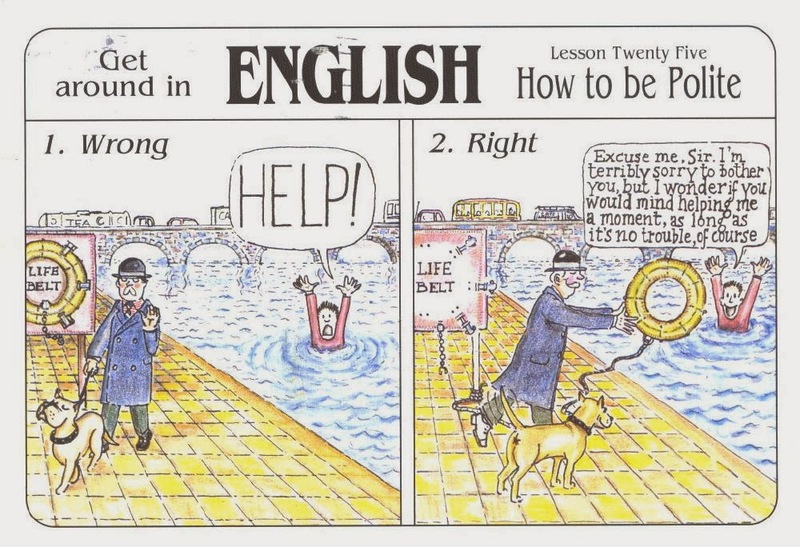 Martyn Ford and Peter Legon published a series of cartoons in the early 2000’s called “How to get around in English” which capture the kinds of problems visitors have with British people in the UK. 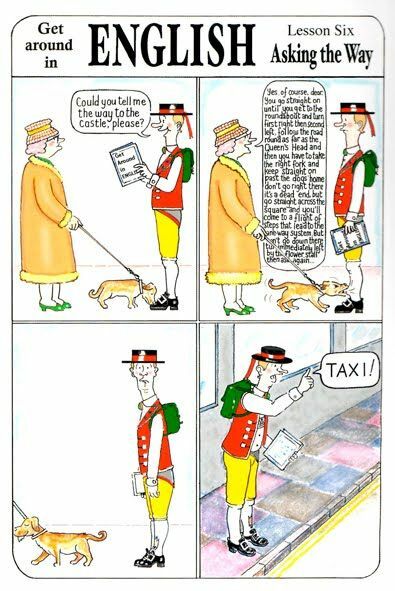 In this cartoon, a foreign visitor – obvious from his stereotypical “German” clothes, and because he’s reading his request out of a phrase book – asks an elderly British lady for directions to the castle. She provides him with unnecessarily detailed instructions, including a huge amount of information about all the routes he shouldn’t take. The foreign visitor ends up taking a taxi. I explained to him that this is just British people trying to be friendly, even if they are clearly breaking the rules of communication that say you should provide an appropriate amount of information in language the listener will understand. However, because in British culture so many topics of conversation are taboo – by contrast, you can talk about practically anything in any situation with Italians – the only opportunities British people get to talk freely when they’re trying to break the ice with a stranger is when they’re talking about the weather – or giving directions. What this cartoon can tell us about the British is that the British value formality and politeness, and that British English has complicated rules about what you can and cannot say to express these values, which are different from the rules of languages which have grammatical polite forms. What most second language users often don’t realise is how idiomatic all languages are. You can’t generate any language from just its grammar rules and vocabulary – if we could, we would be able to rely on machine translation for all our language challenges. Every language assembles words in different ways to express the same ideas. For example, the translations of apparently simple expressions into Italian, such as “it’s not worth it”, “I’ll let you know”, “keep me informed” and “I got upset”, are expressed with very different words and sentence constructions. A useful pragmatic skill to develop for improving communication in our second language is to focus on acquiring “ways of saying things”, rather than on learning grammar and vocabulary. According to futurist and Chief Engineer at Google, Ray Kurtzweil, whose job is “to bring natural language understanding to Google”, and who is determined to stay alive for long enough for robotics to advance to a stage which would allow him to live beyond physical death as some kind of AI, language is the key to the “singularity”, the moment in which robots will become conscious. The purpose of communication is mostly to form, build and maintain relationships with the people around us, which we highly-adapted mammals need to survive. This is something we do almost without thinking in our mother tongues, but when we find ourselves in a foreign environment we can feel surrounded by people who behave in inexplicably ridiculous or offensive ways, and who seem to be either amused or offended by us. I have written here about the resources available to develop our “cultural intelligence”, and I am a living testament to how worthwhile an investment of time and effort this is. You would think that being half-English and half-Italian, spending 5 years of my education in France, and having lived in a number of different countries would make me some kind of intercultural genius, but I was a cultural dummy until I finally opened the copy of “Mind Your Manners” by John Mole, one of the first cultural guide-books, that had sat on my bookshelf gathering dust for 10 years before I read it, 10 years of working with multinational teams. I don’t like to think about how much more effective I’d have been if I’d read the book when it was given to me. If I managed to work effectively in those 10 years before my “cultural epiphany” it was because I relied on another key skill for navigating high-stakes communication situations: active listening, the art of focussing on what the other person is saying, and of checking your understanding of what you think the person you’re listening to said. When you develop your inter-cultural pragmatic skills, you can substantially reduce the potential sources of incomprehension and misunderstanding when you are operating in your second language. I have often observed that people can compensate for a lower level of linguistic skill with good pragmatic skills, and that people with stronger language skills are less confident if they don’t activate their pragmatic skills when they communicate in their second language. An internal checklist of things to watch out for when dealing with different cultures, e.g. attitudes to time, to being direct, to humour, to the truth, to justice, to work, to hierarchy, etc. A more optimistic attitude when dealing with misunderstandings, of “assuming positive intentions”. In my next post in this series, I’ll be writing about different cultural attitudes to work, conversation and socks. Please sign up on my website to receive email updates of my posts.